Tonight's show was unfortunately in the small downstairs room at The Corporation, the drawback of which is the sound is never very good at the front (where I like to be) and the lighting is woefully inadequate, for large portions of the show the bands were in virtual darkness. However, opening band Daxx And Roxane, a quartet from Switzerland but now based in London, just got on with it like they were playing at Madison Square Garden. 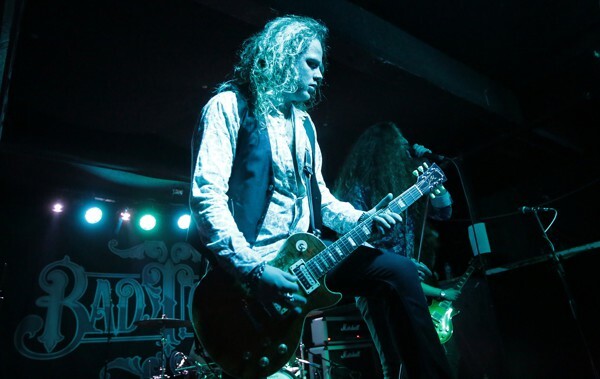 They're a full-on Rock 'n' Roll band who come across like a more melodic AC/DC and have an abundance of energy, in particular guitarist Cal Wymann who is normally known for his leaping around – unfortunately the low ceiling in The Corp prevented too much of this. 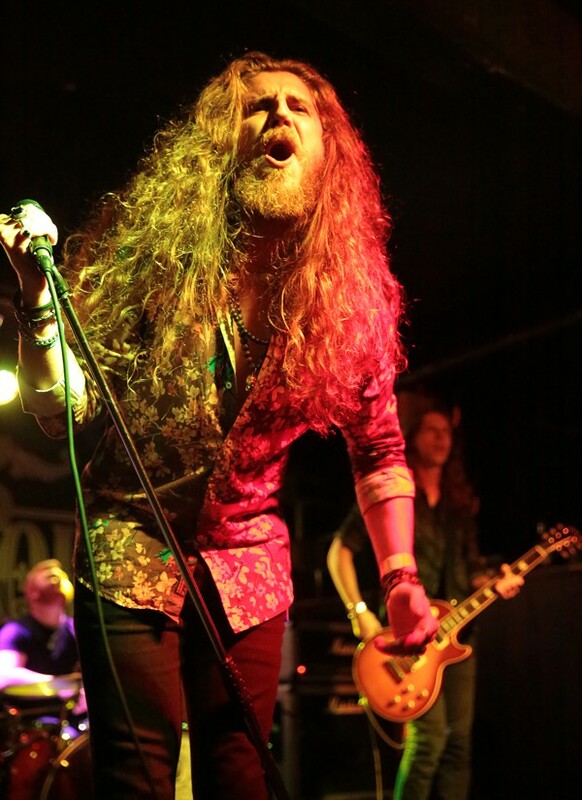 However, they put 110% into serving up catchy tunes like 'Ticket To Rock' and 'Girl Next Door', and even if Cedric Pfister's vocals were difficult to make out due to the muffled sound, they were warmly received. 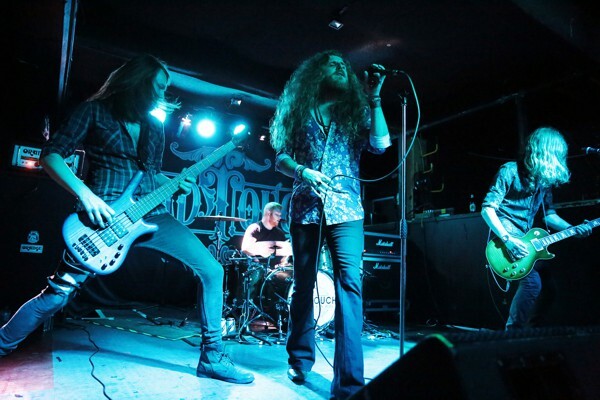 They also attempted to get the audience even more on their side by offering swigs from a bottle of tequila to those at the front, after the band had already shared it – call me old-fashioned, but after seeing the amount of mouths that had already been around said bottle, I politely declined! The brilliant 'Wrong Side' closed a short but highly enjoyable set to rapturous applause. On the other hand, Aaron Buchanan & The Cult Classics I just didn't enjoy at all. The former Heaven's Basement frontman's incessant posturing and preening is one thing I really don't like; there is only one Freddie Mercury, so aping his moves was never going to impress me. His voice is perfectly fine, but I couldn't stand watching Buchanan's prancing about so I focused my attention on the band; I have to admit, they're a great set of musicians, particularly the drummer Paul White, but I couldn't connect with them musically because I don't really like their brand of Arty Post-Grunge, and for me the songs seemed disjointed and lacking hooks. The only real point of interest in the set was when halfway through one song they incorporated snippets of The Knack's 'My Sharona', the riff from Iron Maiden's 'The Trooper' and The Police's 'I Can't Stand Losing You'. Buchanan's somewhat contrived crowd-surf was the final straw for me. They definitely won over a fair portion of the audience who seemed to love the performance, so fair play to them, but it wasn't for me. Every time I see Bad Touch perform live I can see that their confidence levels have grown as a unit, though they're still very humble, without a trace of cockiness, and seem extremely overwhelmed by the size of the crowd and the amazing reception they were awarded tonight. Indeed, when they posed for the now-traditional band/audience photo at the end of the set, front-man Stevie Westwood quips it's "so my Mum believes how many people were here". You'd better believe, Mrs Westwood, because your son and his band are superstars in the making. The young quintet from East Dereham in Norfolk are obviously immensely proud of their new album 'Shake A Leg' – and rightly so because it's outstanding – because no less than nine songs were selected from it for tonight's set-list, including the opening salvo of 'Show Me What It Means', 'Lift Your Head Up' and 'Movin' On Up', with just a handful from their previous albums 'Half Way Home' and 'Truth Be Told'. 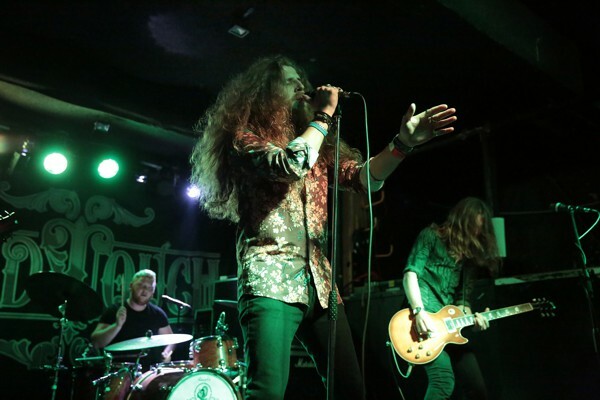 It's impossible not to get swept away by their brand of no-frills, bluesy but very melodic riff-based Rock 'n' Roll, and the hard work they have put in with an immense amount of touring has made them an immensely tight, top-drawer live act. 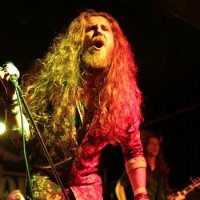 Stevie Westwood's cheeky-chappy persona and brilliant voice make him an engaging front-man, lead guitarist Rob Glendinning is a quite superb musician who displays a wonderful feel for the Blues with some of his licks and beautiful solos (his extended workout on the Southern Rock-tinged 'Outlaw' is just awesome! ), while his foil on rhythm guitar, Daniel Seekings, is the man with all the impressive Rock star moves. "Seeks" didn't seem to sing too much as he normally does during tonight's show, instead the bulk of the backing vocals were supplied by drummer George Drewry, who demonstrates a quite amazing set of pipes himself, while Michael Bailey holds down the other side of the rhythm section with some highly intricate bass lines. However, they also know how to take their foot off the gas, as shown by the stunning version of the ballad 'Take Your Time', where the instrumentation is stripped right back and allows Stevie's voice to really come to the fore, while the understated guitar work from Rob G is just sublime. But what I really love is how Bad Touch have reached the stage where they feel brave enough to play around with their songs by cleverly segueing into some well-loved classics. Indeed, the fun oldie 'Good On Me' ("a song about wearing women's trousers") incorporates ZZ Top's 'Sharp Dressed Man', the scorching 'Skyman' neatly slipped into Whitesnake's 'Still Of The Night' (where Stevie absolutely nailed the vocal, much better than Mr Coverdale can do it now! ), and main set-closer 'Down' (a brilliant song that harks back to their first EP "when we were still full of beans!") pays homage to the Marshall Tucker Band with a snippet of 'Can't You See'. The fifteen-song set rattled by way too quickly, culminating in what is quickly becoming the Bad Touch anthem, '99%', the great sing-along Rock 'n' Roller to end the set on a high. I've said it before, if you haven't seen Bad Touch before, I urge you to catch them while they're still performing in clubs, because they have the potential to be huge. My team Norwich City had thrashed Sheffield Wednesday at Hillsborough this afternoon – they weren't the only group of lads from Norfolk to play a blinder in Sheffield today. Bad Touch, back of the net!